What alimony is and how it works? 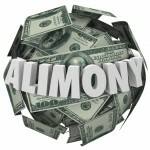 Most of the people are not informed about the term “alimony”, leave apart its procedure of working. So here is this write-up explaining the definition of alimony together with the entire process of its working. First of all, the question arises is what is alimony? Basically, it’s nothing but just a term used for spouse support after divorce. Simply put, alimony is the maintenance which the spouse gets after getting divorce. According to the law, the husband and wife are meant to support each other after getting married. The same obligation continues even after the divorce and thus the person (generally husband, but not always) is required to pay a certain amount to his/her spouse in form of alimony. Alimony has always remained a point of debate and confusion. The simple process of alimony goes as such. If you want spousal support, first thing you need to do is filing in the petition or response. The two parties can either agree to their own amount by presenting a written agreement. And if either party doesn’t agree with the decided amount, the judge makes the decision according to some circumstances. These circumstances include the duration of the marriage, the age and health of two sides, properties of each party and the obligations and assets. It is not necessary that the alimony will be granted on each separation. There are cases when alimony is not applicable. For instance, if a marriage is very short, and the couple do not have any child and both spouses can take care of themselves, no one is bound to pay anything. Another question that may arrive in your mind is duration of alimony support or spousal support. This too depends upon quite many factors, most prominently the length of the marriage. Generally, the alimony period lasts for half of the length of the marriage but this may vary according to some other aspects. Health and financial situations of the spouse puts great impact on the duration, and it can be increased if the spouse is suffering from bad health or monitory conditions. There are some cases when spousal support ends right away. One such case is when the recipient re-marries or either spouse passes away. The bottom line is; alimony is meant to protect or support the spouse from bad financial conditions and the judiciary takes great care that no one misuses it. Thus it lasts as long as the recipient needs it.